Almost 71 years to the day after immigrating to US from post-war Europe, Jack Nasielski joins his children, grandchildren and great grandchildren as he makes Israel his home. 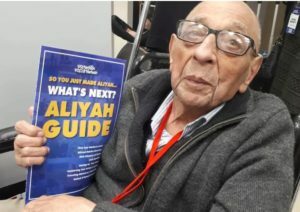 Jerusalem – Jack Nasielski, 92, from Edison, New Jersey, landed in Ben Gurion Airport yesterday on a Nefesh B’Nefesh group Aliyah flight, in cooperation with Israel’s Ministry of Aliyah & Integration, the Jewish Agency, Keren Kayemeth Le’Israel and JNF-USA, together with another 27 new Israeli citizens. For Jack, this is yet another chapter in his eventful life. Born in Dessau, Germany, Nasielski, a Holocaust survivor, fled the Nazis as a child through Poland, and eventually was captured and sent to four different camps including Auschwitz and Blachhamer where he was finally liberated in 1945. Jack is fulfilling his Aliyah dream almost 71 years to the day since he arrived in New York on a boat as a post-war European immigrant. For almost 20 years now, Jack has lived in Edison, New Jersey, following his daughter Lilly and her husband Bruce. Now he is following his children again as they all make Aliyah to Rehovot this summer to join Lilly and Bruce’s four children and Jack’s many grandchildren and great- grandchildren who already live in Israel.